This works no problem. It copies all 29K files. The next step is to get all of the content inside of the folder and filter it down. Right off the bat, I have an issue. When Getting Folder Contents and checking Repeat For Each Subfolder Found around 8,000 files are missing. I can't seem to figure out what is causing this or how to fix this. lastly these items that have not been modified within the last 7 days and are not folders are moved to the trash. 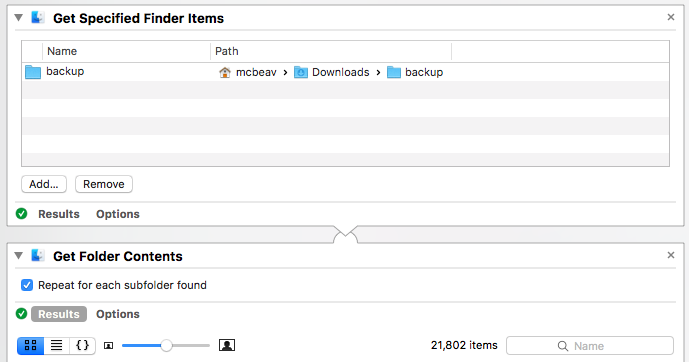 So if I ignore the initial 8,000 files missing when Automator initially gets the folder's contents, and run this it does not work as intended. It does delete a lot of files, but a ton of files that have not been modified within the past 7 days are left, and I can not figure out why some files are being deleted and some are being left. I'm not sure if there is a flaw in my process or what I am missing here. Can someone point me in the correct direction for what I am trying to achieve? Browse other questions tagged finder automator filesystem folders . 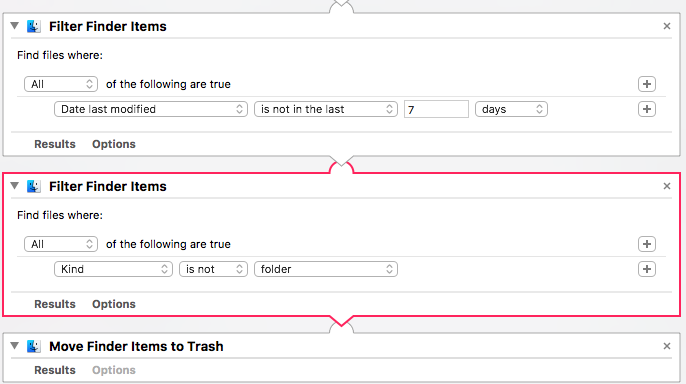 Can Automator distribute a large number of files into counted subfolders?